Oh my. Truly, we may be the luckiest people on this earth. From the moment we stepped off the airplane onto the tarmac in Coimbatore, we could tell everything was different. There was only a small handful of people waiting for passengers to arrive, and our driver clearly didn’t have to guess which people he was picking up – he saw from afar the three white people and didn’t wait for us to identify ourselves as the names on the sign he was holding. He ushered us into the parking lot, and from the quiet sense of calm in the air we knew we were far from Mumbai. 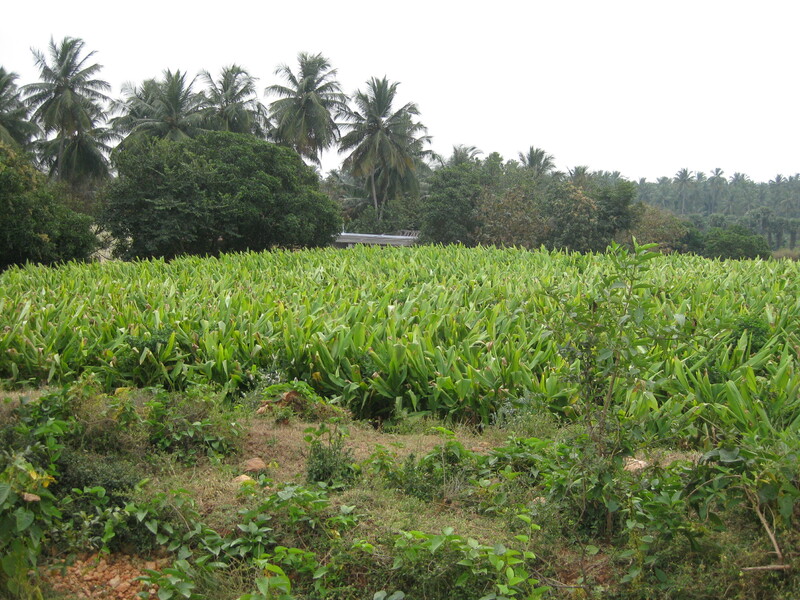 The drive to Vaidyagrama took about an hour through lush green land dotted with palm trees, small houses, and fields. We were surrounded by vegetation, and before long small mountains appeared in the distance. As we drew closer to them, our driver explained that an engineering school was being built at the base of the mountains by Ammachi’s philanthropic organization. When we turned off the main road and onto Vaidyagrama’s dirt entry road, he said we were about 4 kilometers from the border with Kerala (the next state over from our state of Tamil Nadu). Several of the staff came out to greet us as we pulled up at the entrance. There was a flurry of introductions and exclamations. I was eager to meet Aparna – she was the main staff person we have been emailing to make arrangements, and she and I had actually been in communication since last summer. She asked, “Which one is Ivy-ji? !” and we hugged hello. They helped us carry our luggage over a rough pathway alongside an evident construction area to our building. All of the buildings here are connected by pathways and courtyards open to the outside air. The four bedrooms in our building will be occupied solely by our group. Lynn and I were led to our room and we entered into a small foyer with a table and a wardrobe adjacent to an ample bathroom. To the right was a large bedroom with two single beds covered by mosquito nets facing double doors that opened on to a private patio. It is amazingly beautiful and cool with tall ceilings and whirring fans overhead. They told us that we are the first inhabitants in this building, that they had just put the finishing touches on it that day, so to inaugurate the building they were conducting a small ceremony in the back treatment room. We gathered with several of the doctors and therapists around a pot of milk on a small camping-style stove, and they boiled the milk until it ran over the edge of the pot. They poured everyone a cup, added a bit of sugar, and we all drank it down. A sweet welcome indeed. We arrived here on Wednesday and classes begin tomorrow, Monday; the three of us are so grateful that we got here early and have had these days to settle in and let go of the stress of Mumbai and traveling. The quiet countryside and the simplicity of the buildings and grounds encourage letting go. This place is designed for patients, and for someone receiving treatment here the intention is that they have very little to do, that they unplug from stimulation of every kind (I will write a great deal more about the treatment philosophy in the weeks to come). As students here, we will certainly have a great deal more to do, but for these several days before classes start, life is very simple indeed. The day begins at 6:15am with optional morning prayers for the patients and students led by Dr. Ramdas. He is the head physician, and he will be our primary teacher. He is a very gentle and warm person, with a perpetual smile on his face, and his chanting is deep and resonant. Prayers are held in one of the patient buildings, all of us sitting together on the ground around the open courtyard, and his voice fills the space with the feeling of a deep, flowing river. We chant eight or nine prayers together and then Dr. Ramdas chants for about 20-30 minutes. He then leads us in pranayama (breathing practices that improve the flow of energy through the body). After the prayers end, Dr. Ramdas comes to each person and places a few drops of water in our hand (which we drink or place on our crown), then he places a tulsi (holy basil) leaf in our hand (which we eat), and finally he puts a sandalwood paste tilak, or mark of auspiciousness, on the third eye between the eyebrows. It is dark outside when we start morning prayers, and when we are done the sun has risen. It is the most beautiful way to start the day. The rest of the day is punctuated by meals – breakfast at 8am, lunch at 12:30, tea and steamed banana at 4, evening prayers at 6:15, and dinner at 7. Between those hours, we are on our own. We have been reading, napping, doing yoga, walking a bit, catching up on email (or blogs!) and sitting still. Each afternoon, the staff come through to fumigate our room – they take two little wooden pots with burning cow dung and pour some kind of herb powder on it which makes an enormous cloud of smoke, which discourages the mosquitoes from coming in. They smoke up the whole room and you can see clouds of smoke emerging from the screened in windows and doors if you’re outside. The smell is strong but not unpleasant. Then a different set of staff come through to do a “turn-down” service in which they remove the bedspread, lay the comforter across the bed, and let down the mosquito net, tucking the edges firmly under the sides of the mattresses. 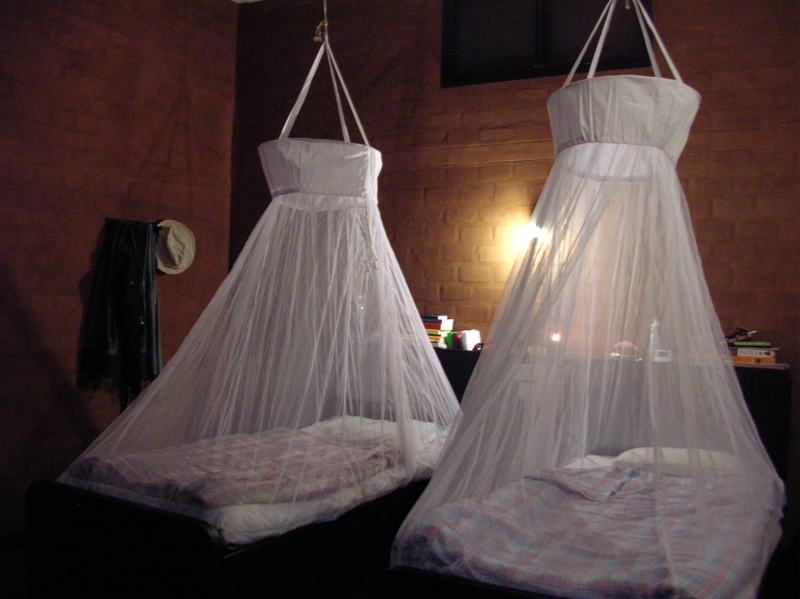 Lynn and I want to sleep in a mosquito net for the rest of our lives – it makes the most secure, cozy cocoon for sleeping. The weather is perfect. It is cool in the morning and evening, requiring a light shawl or wrap, and while it is certainly warm in the mid-day sun, if you stay under shade or a ceiling fan, it is lovely – especially in the buildings which retain the coolness of the night in the clay brick of the walls. There is usually a breeze, and the mosquitoes only come out at dusk and dawn. While we have all gotten a few bites (except for Ras, ironically the only one taking anti-malarial medication), they are not swarming. The evening we arrived, as I looked out at the horizon, I could see palm trees surrounding us and the mountains in the distance. From the vantage point of Vaidyagrama, the nearest mountain looks like the silhouette of a now-familiar friend.… It seems we have found a very special new home. I’m glad to hear the traveling went (relatively) smoothly and that Vaidyagrama is treating you guys so well! 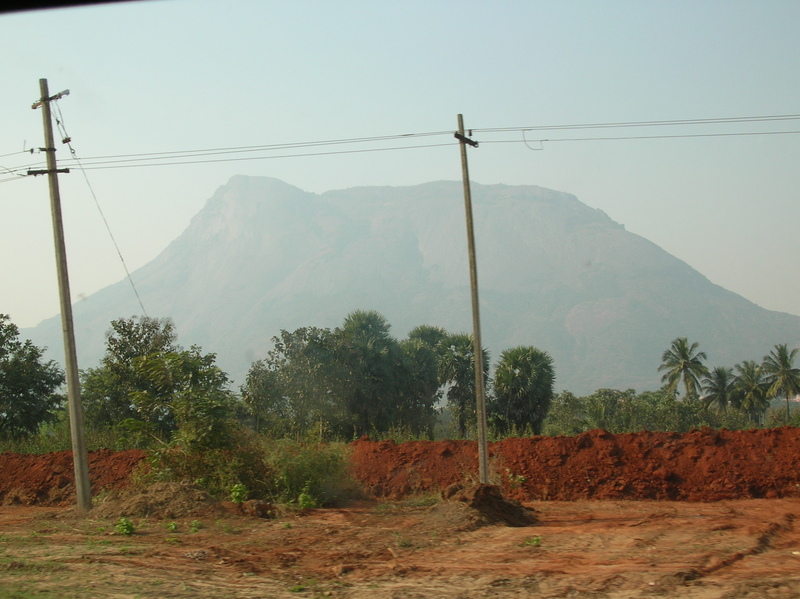 The steep slopes of Mount Anamalam kind of remind me of Saddle Mountain back here in Oregon. I hope you all continue to enjoy the rest of the Vaidyagrama experience! Indeed, we are being so well treated – by Vaidyagrama, and really by India as a whole. My time here really couldn’t have been smoother, when you consider everything. It has been a very gentle introduction – I got just enough pandemonium in Mumbai to believe I was there, and not enough to intimidate me or make me vow never to return! I guess Mount Anamalam does have a Sandia look to her… but of course, *I* saw an elephant! Ganesha watching over us…. Lovely blog. I am researching go here. Did you have any “official” certificates before joining this program? If i only have a basic grasp on Ayurveda would i feel overwhelmed?